Great fishing to report for the Month of June in the Naples and Marco area, which should continue through July. What can I say it has been a banner June for fishing in our area. Despite the fish loss over the winter the Snook fishing has been excellent. We lost many fish but thankfully when we lost those fish we had the largest numbers than we had ever had and we are left now with less fish but still plenty to catch and release. I still believe they should keep the season on the fish closed for at least one more year. The Snook are heaviest in the passes and along the beaches, typical for this time. We are also catching them in the bays adjacent to the passes. There are a few in the backcountry creeks but not as productive as the outside. There are also quite a few big fish that we have caught on the near shore reefs. If you want to fish them you need to be early or late and get some fresh pinfish or white bait down on the bottom. Fly fishing in the evening and night time has been the right time. It has been much more productive than the morning fishing. If you go early in the morning it is very good but you have to get out before light and get off the water before 11 am. Along with the Snook on Fly we are catching a few Tarpon. 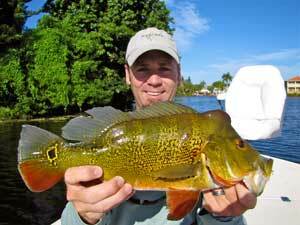 The small ones are scattered in the backcountry and there are quite a few around the docks in Marco and in Naples. The big girls that are traveling the coast have been here today gone tomorrow. One day we find them and they are happy and want to play ball the next they are scattered and moving fast and furious. Some days finding them is a struggle and the next they are everywhere. Persistence pays off though. If you are serious about fishing them you have to be Johnny on the spot and be there. It is a long boring day but if you stay with it eventually you will get your shot. For bait fisherman, I am finding a live crab under a cork has been working a little better than a White bait or Thread but this is marginally better. Keep up the vigil and you will connect. Pictures this month come from some clients that fished for 7 days. We were able to catch good numbers of Snook and they were able to catch their first Peacock bass on fly there largest Largemouth Bass on fly and even their first ever Pompano and Permit on Fly. Permit and pompano fishing has been very good this past month. They had a few good opportunities for Tarpon but never connected but we did not fish for them much. They wanted some different species this year and I am happy to say they connected again. July Fishing should get even better. With the impending rain I would expect the bugs to get worse the fisherman to lessen and the fish to fire up. 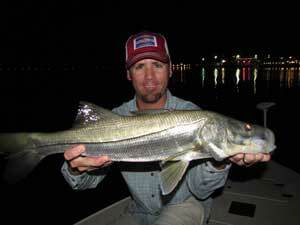 Small Tarpon fishing should really pick up the pace and the Snook will stay right on track. The first spawns will be over and the Snook should stay hungry and catchable. Snapper fishing which has been very good will continue right though July. The good Trout fishing we have been having in June will most likely slow down, but we have been lucky so far it should have slowed in June but it is continuing strong. Largemouth bass the in the glades will have to be done early or late in the evening, but the peacocks should be hot for the fly all day. They like the heat if you can stand it. I suggest on and off the water early. Big Tarpon fishing is always a question in July we will just have to wait and see. I would expect with all the problems to our North the Tarpon may stay south a little more this year. The bait is here and we are even catching fish that should be to our North so I believe the fish are repositioning themselves out of troubled waters. Please everyone that is reading this. We have no oil in Southwest Florida. The news sometimes portrays the worst scenarios and scare people away from the gulf of Mexico. It is a very large area and we are fine down here. Our Fly shop in north Florida a little more of a problem. We are still open for business but they are finding Tar balls up there. Fishing is still pretty good up there but nobody there wanting to fish.